The Will to Battle (2018. 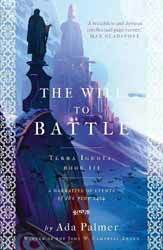 430 pages) is the third book in the Terra Ignota series of science fiction novels, written by Ada Palmer, an American historian by trade who is also a composer and manga and anime consultant. So, lots of strings to her bow, all of which she brings to bear in this densely rich set of novels. As well as the usual, mainstream science fiction novels, which are being published, I have noticed an interesting trend in authors, like Palmer, producing works which are complex, thought provoking and challenging. She is the winner of the John W. Campbell Award, which won best novel for Too Like the Lightning, the first book in the series. The title pretty much tells you what is explored in the book's narrative, it is reminiscent of the events which preceded the commencement of the First World War, in that, it was not that there was an overwhelming clamour for war, it was rather that there was not enough passion for peace. The narrator is presented with Graves’ Claudian device of supposedly writing not for his own time, but for some unnamed further reader. This conceit places the reader into the position of not reading a possible future but a possible past, the reader becoming the historian, trying to separate the fact from the fantasy. The story is told through the eyes of our unreliable narrator, Mycroft Canner. Canner serves in this position as penance for a series of brutal murders he perpetrated when he was seventeen. The fact that he has been certified insane brings a certain ambiguity to the voracity of his recordings and the multiple literary presentation techniques further the reader’s sense of insecurity with the story as Mycroft records his hallucinations with the same level of accuracy as he does the political machinations. Now, there are going to be some readers who consider the language, concepts and stylistic tricks are in of themselves pompous and there would be a little truth in this. However, in my mind Palmer strays very little into this country, rather she is displaying the technical and intellectual force of a science fiction writer at the peak of their abilities. Where the first two books examined the ideas of gender and utopia, this current novel examines war, not in its bloody consequences, but in the way that supposedly good men can always find moral reasons for killing their fellow man. Where many book feel like light confectionaries, Palmer serves you up a cornucopia of ideas which will leave you full to bursting.